While observing stool specimen for parasites, discerning the parasitic forms from the artifacts present in the stool is the most critical step. The stool specimen usually has various artifacts and confounders like epithelial cells, white blood cells, plant hair, fungal spores, muscle fibres, yeast, air bubbles, fat globules and pollen grains which usually confuse the observer by resembling cysts and trophozoites in size and morphology. Observation of various fields and closer look of the internal structures and morphology and measurement is often essential to differentiate artifacts from real parasitic forms. 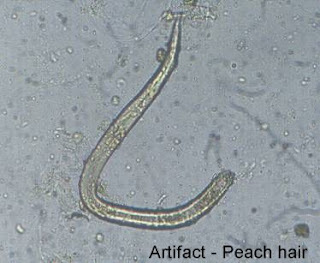 Check out this interesting page or here for examples of artifacts that may be confused for parasitic life stages. 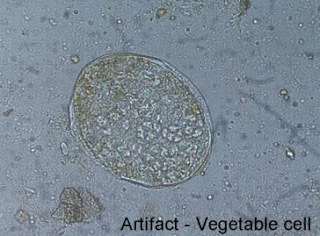 Artifacts should be considered on the basis of size, shape, lack of organelles and defining feature, and variable reactivity with common stains.